Paul Ryan, “Threeing & the relational circuit” (1970’s – ongoing). In the first ‘Semiotics as Art’ Kosuth said: “Works of art are analytic propositions”. So what of an art practice that’s all about investigating & formalizing “positional instead of propositional relationships”? Paul Ryan (1943) is a New York based video artist and associate professor of Media Studies at the New School. Once assistant to media-guru Marshall McLuhan, full blown C.S. Peirce & Gregory Bateson adept, his work on Threeing & the relational circuit, for me, is quite spectacular as it does something I’ve not witnessed elsewhere: it lets you experience, feel Peirce’s first, second & thirdness. As semioticians we tend to think about those categories, we try to envisage them, work with them … but have you ever tried sensing their affective power? 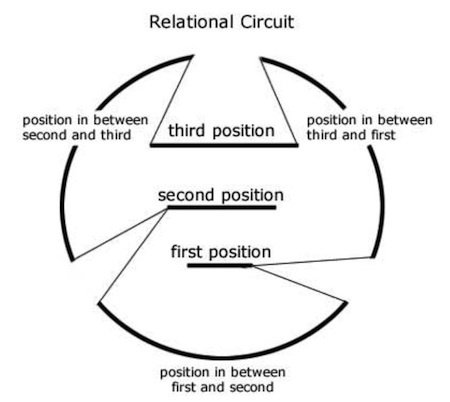 The relational circuit & Threeing. 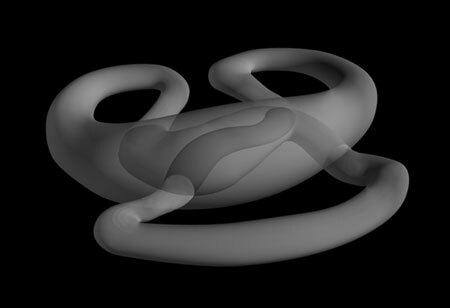 The diagram below was taken from the paper “The sign of itself” by Paul Ryan as a 2-D rendering of the 3-D relational circuit shown above. The idea is that people use the relational circuit outline to move into the space it automatically creates and change positions via the continuous paths, with only one single person allowed per position and no predefined rotation, start or finish. The person which takes the position of firstness will become the initiator and so on. Ryan developed both a verbal and nonverbal practice of Threeing as well as a way to create the relational circuit alone through the use of video. The application of the practice is legion. It has already been used by public school teachers learning about sustainability, engineers searching for new jobs, professionals addressing climate change & those are but a few of the examples Paul Ryan & co. have already worked on. Conflict resolution, team building & so many other applications come to mind. John Updike said: “What art offers is space – a certain breathing room for the spirit”. Ryan does just that & more. The work is difficult to categorize, hence the interest! Art that has practical applications is quite unique – so is using semiotic theory as the guiding principle of a relational Yoga. On his website you'll find workshops for threeing, with positional diagrams explaining how it all works as well as his paper “The sign of itself” and his revised paper on “The Relational Circuit”. He’s been published in semiotica “Gender and Threeing, Ecology and Cyberspace”, in the American Semiotic Society Journal “Bateson, Peirce and the Three–person solution” et al. For those that have the time there’s an hour-long interview from 1995 on youtube where Ryan tells some brilliant anecdotes about McLuhan, Bateson and others here.